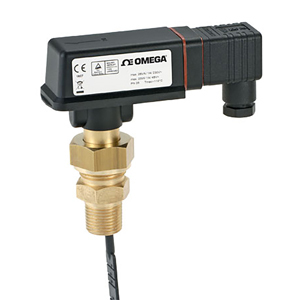 The FSW301 flow switch comprises a paddle system with a permanent magnet attached. Above that magnet is a reed contact, located outside the flow of fluid. A second magnet with opposing poles creates the force necessary to reset the switch back to the no flow position. When the monitored flow pushes the paddle and changes the position of the magnet in relation to the reed contact it activates the contact. As soon as the flow is interrupted, the paddle moves back to its starting position, which returns the reed contact to the initial position. The force necessary to push the magnet back is provided by the two magnets repelling each other. Using magnetic force instead of the usual leaf spring means the switch is considerably more stable in the long term and much less sensitive to pressure peaks. The reed contact used as a sensing element consists of two ferromagnetic contact blades located in a glass bulb filled with inert gas. This practically eliminates wear resulting from contact burning. This construction allows a useful life of up to 100,000,000 switching cycles.